Sharing an awesome and new concept of building relationship and side by side earning free mobile recharge through Freecharge freefund coupon codes. The Android application named "Vee - We make relationships" has unique concept of discovering eligible educated singles in your area, matching your individual personality and interests. Vee does not recommend or present any person or profile looking for a casual hookup or casual dating. Vee recommends or connects you with people looking for new friends or meaningful relationships only. As we all are aware that now days free recharge offers and discounts are getting very famous and in demand so this app also came up with youth interest. 2. After downloading, install it and you will see above page. 3. Click on "Sign in with Facebook". 4. Now you need to allow this application on Facebook by clicking on OK.
5.After doing this your account gets created. 6. Now you will see above page where it will load and search for eligible educated singles [Male / Female] in your area. You can check there professional / personal details which they have shared. You can like there profile by clicking on Green Thumbs Up button or else if you dislike then Red Cross button. You can also chat with them anytime. - Click on Upper Left Corner where three horizontal lines are present. Click on that. - There you will find and option to "Refer & Earn". - Click on that and there you will find three options "Share", "Earn" & "Redeem". 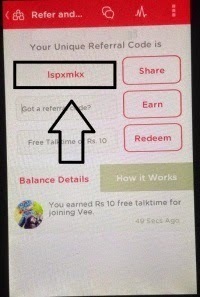 SHARE: It is you own referral code which you can share with you friends to earn Rs. 20 per refer. EARN: Here you need to add my code. Both of us will get reward for it. You will get Rs. 10 Freecharge Coupon Code for entering it. Copy below code and put in second box then click on "Earn". REDEEM: After getting earning for referrals and joining reward by entering above code. Simply click on "Redeem" and within few hours you will get your freecharge freefund code on your mail and on this application. * For Daily visit 20 Points. - Please use only genuine FB profiles to create an account. Our system does not redeem coupons earned through fake FB profiles. - Multiple account logins from a single device (phone/tablet) will not be considered genuine. Friends referred should login using their own personal device (phone/tablet). In a case, where multiple account logins happen from the same device, all profiles will not be considered applicable for redemption. - In order to earn direct referral talk time, please ensure that the registration process for your referrals is complete.